7. Twist a cliché. Do something new with the tried and the true. Use the clichéd plot not as something to reproduce faithfully, but as a classic human drama to explore in a new way. Show the human depth under the stereotype: the blonde bombshell who walks into the private eye’s office is worried because her elderly neighbor won’t answer the door. Using the familiar conventions of your genre or story type will let you lull the readers into comfort... while the "twist" will jolt them into new excitement. You can juxtapose the old with the new to reveal facets of each. Just consider how vital an old story like Romeo and Juliet becomes when the basic plot is set in the tenements of New York (West Side Story), or is rendered in a new way (like my friend Judith Whitmore's graphic novel). Example: JK Rowling's entire Harry Potter series twists many clichés of the late, lamented "boarding school dramas" which were popular in Britain in the mid-20th Century. (There were similar books in the US-- A Separate Peace being perhaps the most notable-- and I still see echoes of that old genre in newer books like The Goldfinch and Fates and Furies.) These books presented a static world with all sorts of expectations and rules, but above all were about children finding ways to belong-- in a world of children, with adults and especially parents as mere visitors or minor characters. Rowling's twist was, of course, to make Hogwarts a boarding school for wizard and witch children. As exotic as that twist is, it gains more resonance by being juxtaposed against the familiar tropes of the boarding school stories-- the different "houses" with their common rooms, the sense of the school as a fortress against the outside world, the examinations and school supplies. Rowling makes great use of the school year as a time-setting-- each book in the series takes place in a year of Harry's schooling, so the first book is set during his first year at Hogwarts, and the last book in his final year before graduation. Now jot down a few "tropes" or "conventions" from the other category. You know-- "Those surfer movies always had bonfire parties at the end, and the main character was usually kind of shy and new at surfing, not one of the champions. And there was always a moment when he doubted himself, but found himself being encouraged by someone unlikely. Also, there were those strange long sequences where all the guys lovingly and lavishly polished their boards." What use can you make of the familiar events or themes from the old story type? Think about set-pieces (like the "singalong scene" in so many films... including in Casablanca, where the singalong is actually a verbal duel between the Resistance and the Nazis.) Also think about time-frames like the surfing season or an election, or clichés like "the makeover where the nerdy girl is transformed to a glamor-gal" and how you can twist that (the nerdy girl is transformed into a vampire, maybe). Just remember to use enough of the old so that the readers will appreciate your subversion of the cliché. 6. Make the internal come external. Explore your protagonist’s internal needs and values, and consider, how will this affect her actions? The external events will cause internal change… and the internal change will cause new external events. Example: In Silence of the Lambs by Thomas Harris, Claire (the FBI recruit) is shown in the opening as both charismatic and alienated from her classmates. She is popular enough, but sticks to herself. Even with her mentor/teacher, she is withdrawn and withholding. The question is posed, why is she so closed? This question becomes more focused when she is assigned to interview a serial murderer who used to be a psychiatrist. His canny reverse-interrogation reveals that her past (as an abandoned child traumatized by a gory event and "thrown away" due to her sensitivity) made her close herself off from others. But it's that very mix of alienation and empathy-- distance and intimacy-- that makes her a good profiler. While at first she's drawn into Lecter's seductive distractions, she can use her ability to distance herself to figure out what he's hiding and what she needs to know. What's important here is that her "internal"-- the inner conflicts and needs-- draw her to this work and make her especially skilled at it, and that the "external"-- the plot events-- force the internal conflict to the surface where it can be revealed and perhaps resolved.... and then help resolve the external conflict (the mystery or quest or whatever). So what is the protagonist's role in the external story/plot? He might be the investigator, the one who must find the truth. He might be the contestant, the one who wants to win. She might be the leader of the team. She might be the one on the run from danger. She might be the helper. She might be the healer. He might be the one who subverts the organization from the inside. He might be the one who invents the machine. She might be the mother of the king. I always try to ask, What does he/she do in the plot that no one else can do? If she's the mother of the king, she's the only one who can persuade him to lift the tyranny established by his father. If he's the one subverting the organization, it's because only he has the cyber-skills to hack into the encrypted files, AND the motivation to bring down the company. Then go inside-- how did she get to be the sort of person would would be in this role? What about him made him want to acquire these skills, or made him good at this? (For example, he was a frightened, secretive child, who had to learn hidden ways to deal with abusers and bullies.) That's the "internal". Now think about what 'internal' motivates the protagonist to get involved and stay involved now, despite the obstacles and dangers? Like - she was married off young to the king, and gave up her freedom in exchange for wealth and luxury... and only now understands that she is in a gilded prison and has learned to sympathize with others trapped in their lives. If you can identify the protagonist's role in the external plot, and also define the "why" of the internal motivation, you'll be deepening your story. The events will become the tunnel from the internal character to the external world. 4. The point of plot is change. The events should cause a change in the protagonist’s inner life, to trade her original goal for a more worthy one, to face a personal issue she’s ignored before, or to resolve a longstanding internal conflict. Example: In Stephen King's The Dark Tower series, Roland has long been determined not to care or love again. Through the events of the plot, he is forced to choose some unlikely allies to help him on his quest. After several battles, he learns to trust them. And in the end, it's his ability to love again that lets him complete his quest to reach the Dark Tower. Your turn! Consider the progress of your plot events and how they change the protagonist. How is this character different in the end because of going through the plot events? What can he/she do in the end that was impossible in the beginning? 3. Give the protagonist a goal, then take it away. The goal-driven protagonist is an active protagonist, but if you just let the protagonist achieve his goal, you’ll have a linear or two-dimensional plot. Have him lose the goal, or sacrifice it, or achieve it and realize he doesn’t really want it, and you’ll add the complication that makes this a real story. Example: In Wizard of Oz, Dorothy has the goal of escaping from her boring Kansas farm and finding adventure. This goal impels her to take risks, meeting with the patent-medicine salesman (who later comes back as the Wizard) and daring the tornado to hurt her. She achieves her goal when the tornado whisks her off to the exotic land of Oz. But just coming up with a goal and attaining it makes for a linear plot! Instead, once she achieves her goal, she realizes it's not truly what she wants, and she forms the new goal of getting back home to Kansas-- a considerably more difficult quest! Your turn! In the beginning of the story, what does your protagonist want to do or get? Think about why the character wants this goal, and what that indicates. Now should your character get the goal or not? Either way, what will the reader learn about this person from the getting or losing or sacrificing the goal? 2. Your protagonist should save the day (or destroy it). Protagonist is the “first actor”, the character most active in the story. Most importantly, he or she should be the one who resolves the conflict in the climactic scene. No one else should solve the mystery, or discover the secret, or arrive just in time to save the day. The plot should force the protagonist to make choices and take actions, and the course of plot events should change in response to those choices and actions. Example: In Casablanca, Rick overcomes his alienation and with cunning and duress, gets Ilsa and her husband Laszlo safely on the plane out of Nazi territory. His sacrifice (he loves Ilsa) shows that he has reached the destination of his journey to affiliation and commitment. This is reinforced when, after he kills the Nazi major, he and his friend Renault join the Resistance, fully committing to the cause. Your turn! Look at the climax towards the end of your story, that big exciting scene where the main external conflict (like the Nazis' attempt to send Laszlo to a concentration camp) is resolved. What can your protagonist do to resolve the conflict? How does this action show that the main character has reached the end of the character journey (like Rick's journey from alienation to commitment). Plausible plotting starts with cause and effect. 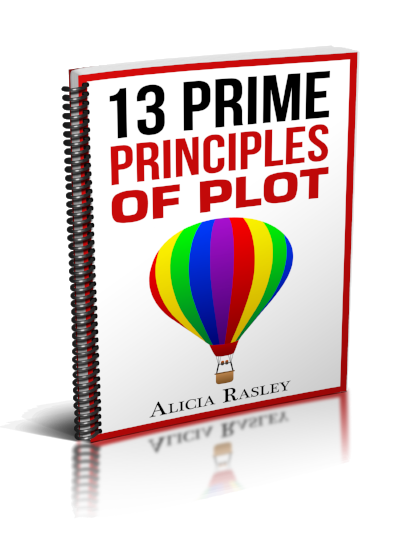 Make sure each step in your plot has a causative event, and one of more effects. Character actions should be caused by some motivation, and should have some effect on the plot. Your protagonist should save the day (or destroy it). Protagonist is the “first actor”, the character most active in the story. Most importantly, he should be the one who resolves the conflict in the climactic scene. No one else should solve the mystery, or discover the secret, or arrive just in time to save the day. The plot should force the protagonist to make choices and take actions, and the course of plot events should change in response to those choices and actions. Give the protagonist a goal, then take it away. The goal-driven protagonist is an active protagonist, but if you just let the protagonist achieve his goal, you’ll have a linear or two-dimensional plot. Have him lose the goal, or sacrifice it, or achieve it and realize he doesn’t really want it, and you’ll add the complication that makes this a real story. The point of plot is change. The events should cause a change in the protagonist’s inner life, to trade her original goal for a more worthy one, to face a personal issue she’s ignored before, or to resolve a longstanding internal conflict. Lead readers to the story, but don’t drag them. Set up your opening scenes so readers are led to ask story questions like “Who killed the film director?” or “What will happen to John and Sue’s love when Sue learns that John has been lying to her?” The posing of the questions, and the desire to find the answers, keeps readers turning pages. That’s called narrative drive. The story question is also an excellent tool to help the writer keep on track. Make the internal come external. Explore your protagonist’s internal needs and values, and consider, how will this affect her actions? The external events will cause internal change… and the internal change will cause new external events. Twist a cliché. Do something new with the tried and the true. Use the clichéd plot not as something to reproduce faithfully, but as a classic human drama to explore in a new way. Show the human depth under the stereotype: the blonde bombshell who walks into the private eye’s office is worried because her elderly neighbor won’t answer the door. Coincidence kills plausibility. Don’t let a one-in-a-million event rescue your protagonist from trouble, or readers will stop believing that this person is truly affecting the course of events. “Exposition is ammunition.” Tell the readers what they need to know, but only when they need to know it, and in the most powerful way. Make them beg for it. An essential question for all plots, but especially mystery/suspense plots, is “What should the readers know, and when should they know it?” Ask that every time you’re set to impart some extra information about the characters or events. Don’t tell so much so early that the reader has no reason to keep on reading. Less is more. Don’t dilute the power of your story by layering on too many conflicts and motivations, or featuring too many secondary characters and viewpoints. Instead, focus on strengthening what you have. Center each scene. Build it around some irrevocable event that changes the plot, and your pacing problems will vanish; readers won’t be able to skip because they’ll miss something important. Find the excitement in every scene. Aim for the strongest, most dramatic events that are plausible within the world of your plot and your characters. For example, your heroine breaking in to an office and reading a file is more dramatic than her just overhearing the same information– but use this only if your heroine is the sort who would, under these extreme circumstances, break in to an office. Always go back to character. The plot should show how these particular people with these particular strengths and values and conflicts react under stress or when pursuing a goal. You’ll lose readers as soon as they sense you’re forcing your characters to behave in a way that fits the plot instead of their personalities and needs.